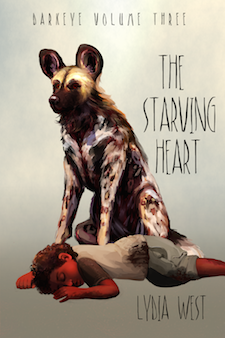 Darkeye Volume Three: THE STARVING HEART now available! In order to protect the child Tareq from murderous painted dogs, Mhumhi and his sister Kutta have fled Wild Dog City for the endless desert. They are searching for the so-called forbidden place- a building where all the remaining human secrets are locked away. The answers to everything that happened to make Wild Dog City what it is. But they are being pursued, and no place is a safe haven for very long. Between their pursuers and the hopeless quest of keeping Tareq alive, Mhumhi begins to feel his spirit finally breaking. When a new group comes upon the scene- the gray pack, a clan of coyotes and jackals that believe that all species should be united- Mhumhi finds his new bitterness clashing with their ideals. 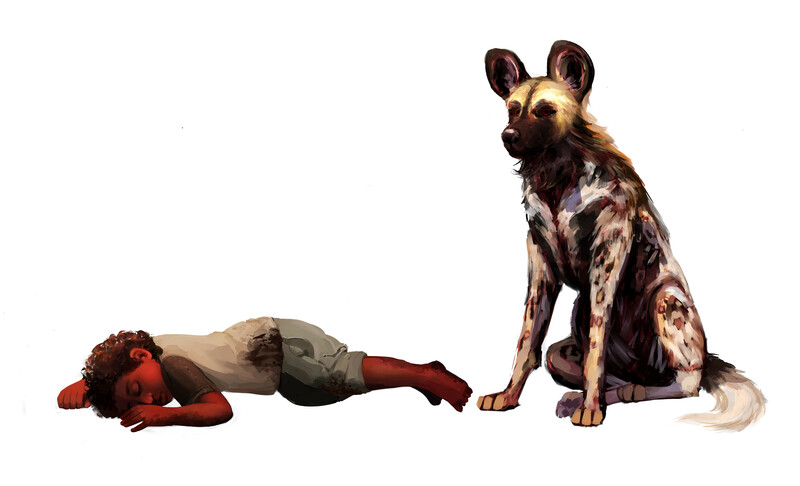 And then someone unexpected asks for his aid: Hlolwa, the leader of the painted dogs, who is carrying her own terrible secret. Includes an extended preview of the upcoming prequel to the Darkeye series!